Orthodontist Tito Norris poses with the candy his office collected last year through a Halloween candy buyback program. Photo Credit. f seeing the heaps of candy your children amass on Halloween gives you a seasonal scare of another sort - oh the sugar! the empty calories! - several local dentists and orthodontists have the perfect solution: cold hard cash. That's what they'll give to kids who trade in their candy - at a rate of $1 per pound. And then, as part of a national effort, they'll send the candy to a nonprofit group that makes care packages for U.S. troops deployed to Afghanistan and other places overseas. But, orthodontist Dr. Tito Norris says, "Let's do it in moderation." 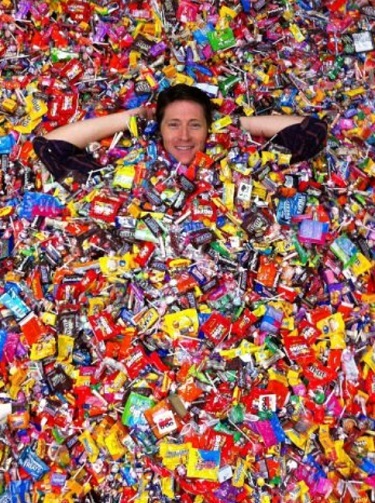 "It's not good for anyone to eat pounds and pounds of candy," Norris says. "It's not good for your body. It's not good for your braces. It's not good for your teeth." Norris' Stone Oak Orthodontics has joined a growing network of dentists affiliated with halloweencandybuyback.com, which allows users to type in a ZIP code and find nearby practices that will buy back Halloween candy. The program, started in 2007 by a Wisconsin dentist and pitched as a way to both benefit kids and brighten the day of deployed troops, has snowballed from about 300 dentists the first year to more than 1,000, including at least four in San Antonio. The dentists send the candy to California-based nonprofit Operation Gratitude, which last year received 250,000 pounds - or 125 tons - of Halloween candy. Operation Gratitude then mixes in the candy when making care packages that also contain toiletries, DVDs, CDs, video games, headsets, webcams, snack food and letters of thanks; organizers plan to ship 100,000 care packages over the next year, says Ann Hamilton, Operation Gratitude's director of social media. As we enter the sweet season, parents are worried kids might indulge their way to obesity by gobbling up too many Halloween candy. But having a little fun with candy once a year will not lead to childhood obesity, says Ken Haller, M.D., associate professor of pediatrics at Saint Louis University. As they left the ADA's annual meeting last week in San Francisco, leaders of a public health dental group were breathing a collective sigh of relief. Resolution 17, a measure some saw as a threat to their organization and specialty, failed to win approval. If it had passed, leaders of the American Association of Public Health Dentistry (AAPHD) said that the resolution could have prevented their organization from continuing to sponsor the board that certifies their specialty. "All and all we are pleased with the outcome," said Catherine Hayes, DMD, DMSc, president-elect of the AAPHD. Public health dentistry is one of nine specialties currently recognized by the ADA. The resolution, put forth by the ADA's Council on Dental Education and Licensure, would have limited voting and holding office within organizations that sponsor a dental specialty to board-certified or board-eligible dentists. In contrast, the AAPHD has a long tradition of allowing nondentists, including hygienists, epidemiologists, and other healthcare professionals, to join and serve in leadership positions. Only board-certified public health dentists are allowed to vote on matters pertaining to the specialty's national certifying board, the American Board of Dental Public Health. But working across disciplines remains an important part of the public health mission, AAPHD leaders said. "In public health, we deal with populations using a team approach," explained Myron Allukian Jr., DDS, MPH, a past AAPHD president. "We need to work with all members of the health team and the dental team." Going into the ADA meeting, one AAPHD member who did not want to be named worried that Resolution 17 was intended as a rebuke against AAPHD's publication of a series of papers highlighting proposed curriculum guidelines for the training of dental therapists, a model strongly opposed by the ADA (Journal of Public Health Dentistry, Spring 2011, Vol. 71:suppl s2, pp. S3-S8). Swiss dental implant maker Straumann (STMN.S) said it would axe roughly 150 jobs to boost margins as it grapples with sluggish demand in Europe, its biggest market. The euro zone debt crisis has battered sales of dental implants made by Straumann and its Swiss rival Nobel Biocare (NOBN.S) as cash-strapped Europeans, worried about the downturn, cut back on non-essential dental treatment. Chief Executive Beat Spalinger said the company had decided to slash 150 jobs by the start of 2013 - roughly 6 percent of its global workforce - after operating margins fell below 15 percent in the first half of the year, a level he deemed "unacceptable". The axe will fall on jobs at Straumann's headquarters in Basel as well as sales subsidiaries around the world while manufacturing will be spared, Spalinger said. Third-quarter sales rose 4 percent to 156.8 million Swiss francs ($167.41 million), compared with an average estimate in a Reuters poll of 158 million.